Nature « How Do You Measure 525600 Minutes? I finally finished the video montage of our South East Asia trip with Broadway On the High Seas 5 through Playbill Travel in November 2015. You can watch it here but I highly recommend watching it full screen to get the full effect of the incredible scenery. If you haven’t already read my daily blog posts from the trip and want to know more– start reading my previous posts at the end of October 2015. Southeast Asia Travel Day Four: Michael and I were both up and wide awake way too early this morning. Not that unusual for me but Michael is usually a good sleeper. Between jet lag and the exciting day ahead, it was difficult to go back to sleep. 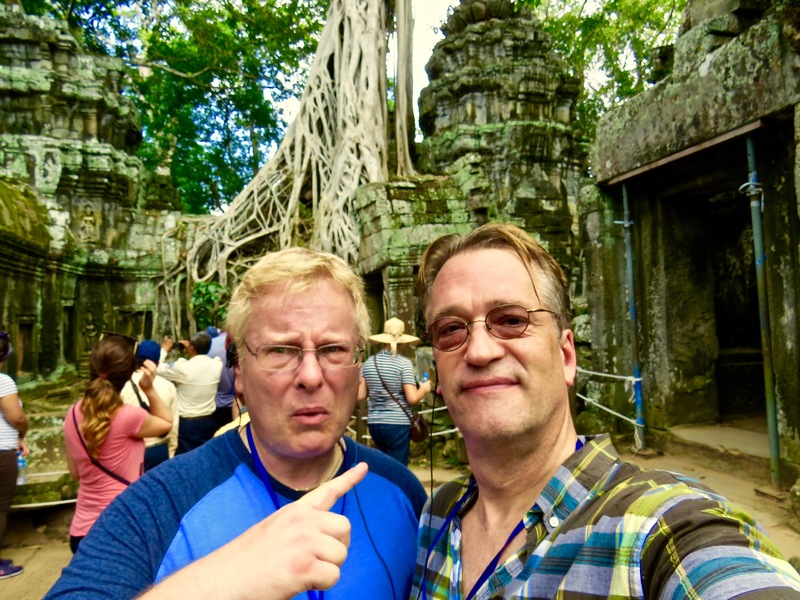 Silly Selfies at Ta Prohm. We were the first ones at breakfast and there was an incredible spread. So many choices from traditional breakfast to local cuisine– everything that Raffles Grand Hotel d’Angkor does is first class. In regards to this trip, today was probably my most anticipated day. That can be dangerous this early in a long vacation but there are also so many unique and exciting things ahead. As a precaution, I try not to allow my expectations to be too high; just to avoid any chance of disappointment. Today was one of those few days in your life you’ll remember forever. A whirlwind of experiences that totally consumes you. Every sense heightened and challenged. Memories indelibly imprinted in your mind. I have a bit of an obsession with history and what was left behind. I’m not as consumed by the facts as I am the aura of the experience. To put it bluntly: I like old things. History not only connects us from the past to where we are now; it connects us metaphysically to all the people that came before us. For me, it’s magic. It gives me chills. There’s nothing else like it in the world. On the Road to… This was our first opportunity to meet some of the people that would be continuing on with the Broadway On the High Seas 5 (BOTHS5) cruise. About 80 of the nearly 300 BOTHS5 participants came to Siem Riep for the 3-day pre-cruise adventure. As we’d find out later, the group was pretty evenly divided between three choices of hotels; then split again into groups of about a dozen for our tour experiences in Siem Riep. This gave us a perfect opportunity to meet new friends, more intimately; prior to the whole group coming together in Ho Chi Minh (Saigon) in a few days. On the road in our tuk-tuk. 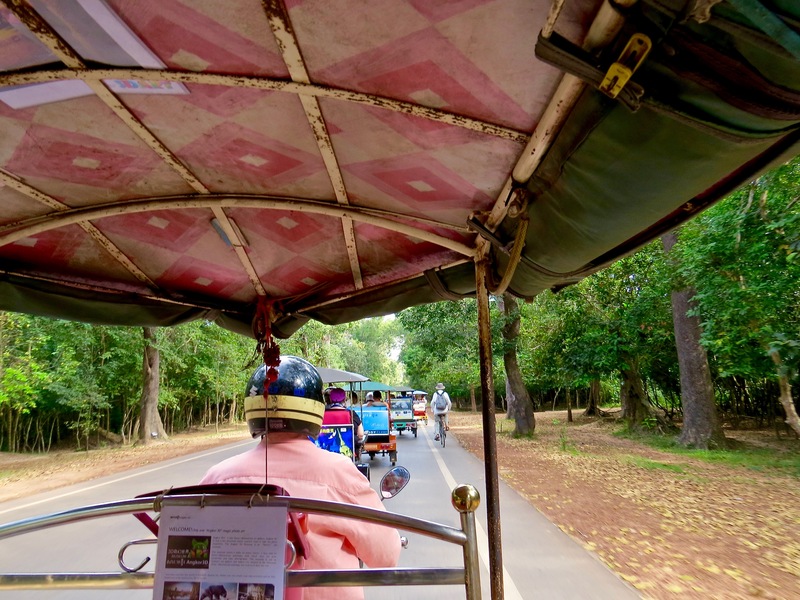 We all boarded tuk-tuks for the short ride to Angkor Wat. What a fun and relaxing way to travel! Some tuk-tuks are bicycle-driven but most are now powered by motor bikes. We were all connected to our guide, Jun, by headset so he was able to narrate the sites along the way. Angkor Wat. 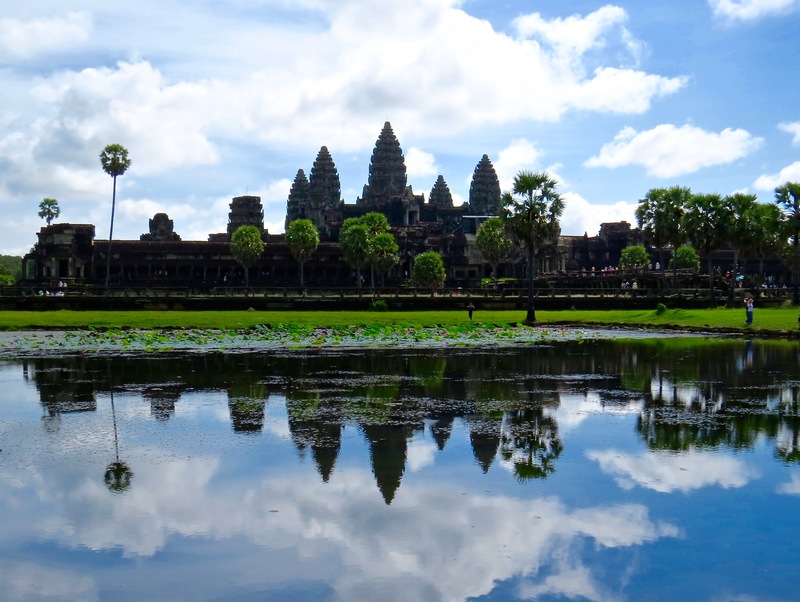 Depending on the source, Angkor Wat is frequently called the unofficial 8th wonder of the world. It’s often on lists of must see places in your lifetime. I think all the Angkor temples (as a group) should be included. 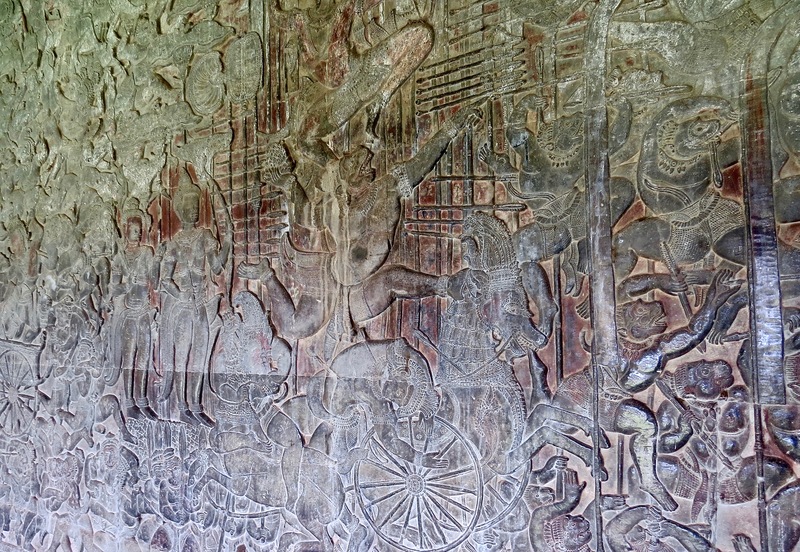 Bas Reliefs at Angkor Wat. 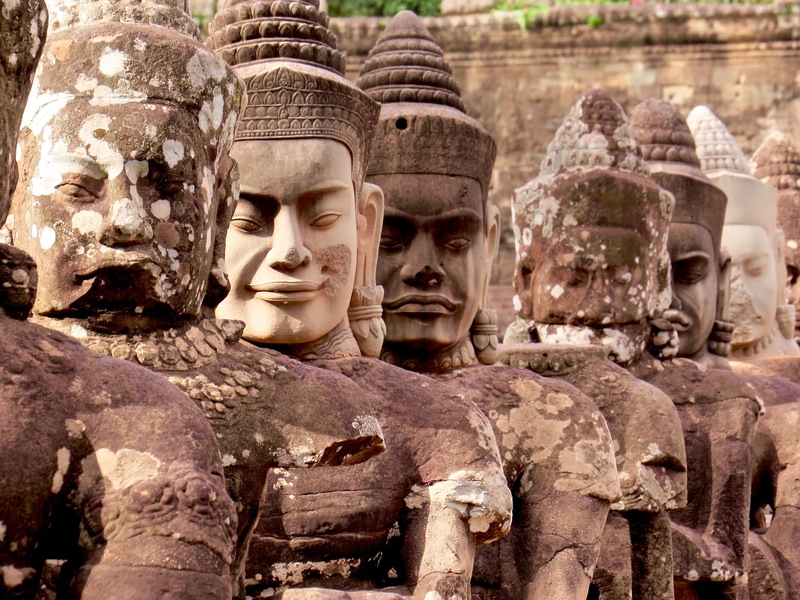 Angkor Wat was built in the early part of the 12th century, over a 30 year period. The workmanship is almost impossible to comprehend. From a distance, it looks like a massive, crumpling stone ruin. As you get closer, the impressive detail begin to be revealed. There are so many elements to be appreciated. The bas reliefs alone contain more than 12,000 square feet of intricate sandstone carvings. 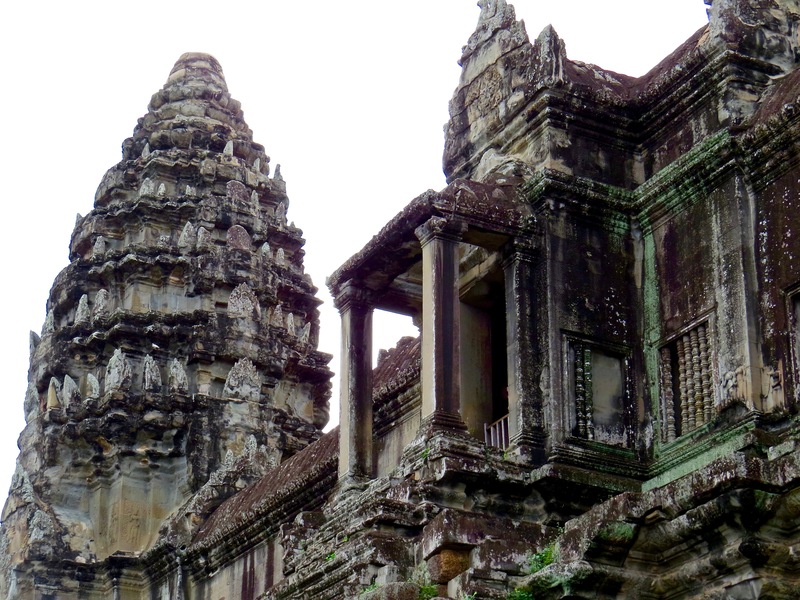 What stands out most about Angkor Wat from the other temples is the size. It’s pretty incredible that it has survived the centuries and much of the detail is in such good condition. 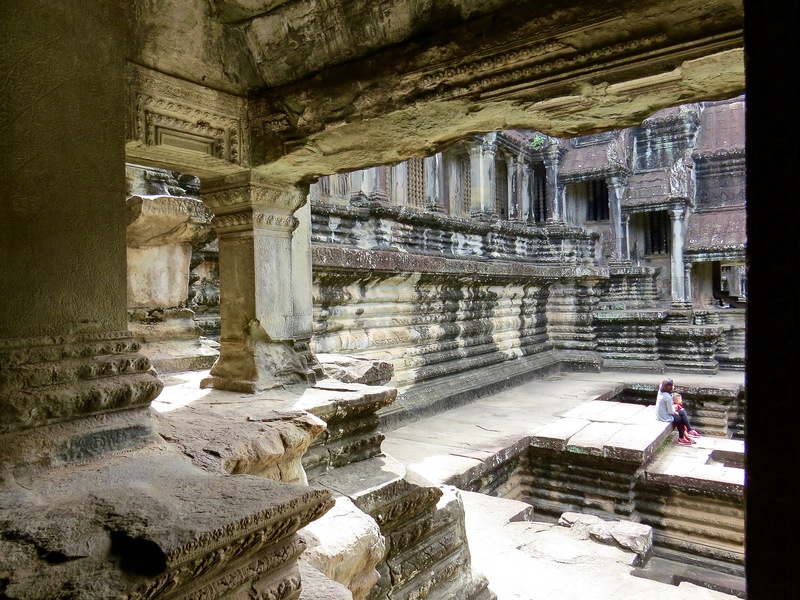 Inside the heart of Angkor Wat. Looking up in one of the entries in Angkor Wat. One of the statues of Budha. 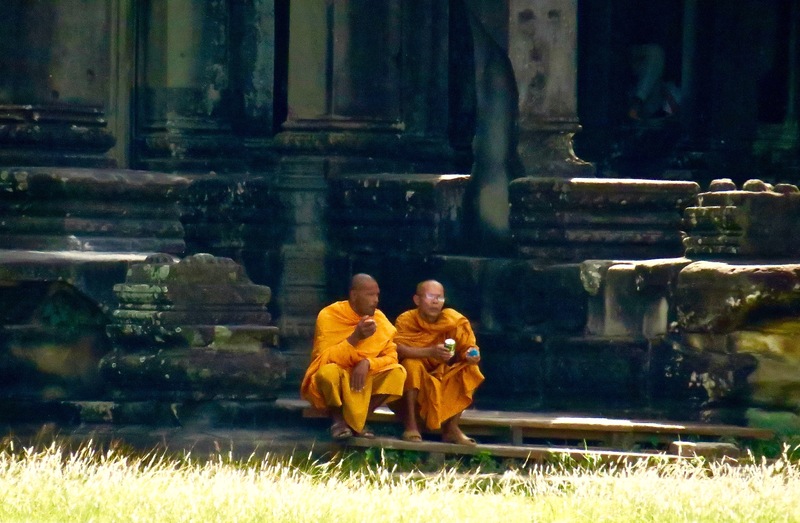 Monks can be seen throughout Angkor Wat. Incredibly detailed exterior walls protect the inner temple. 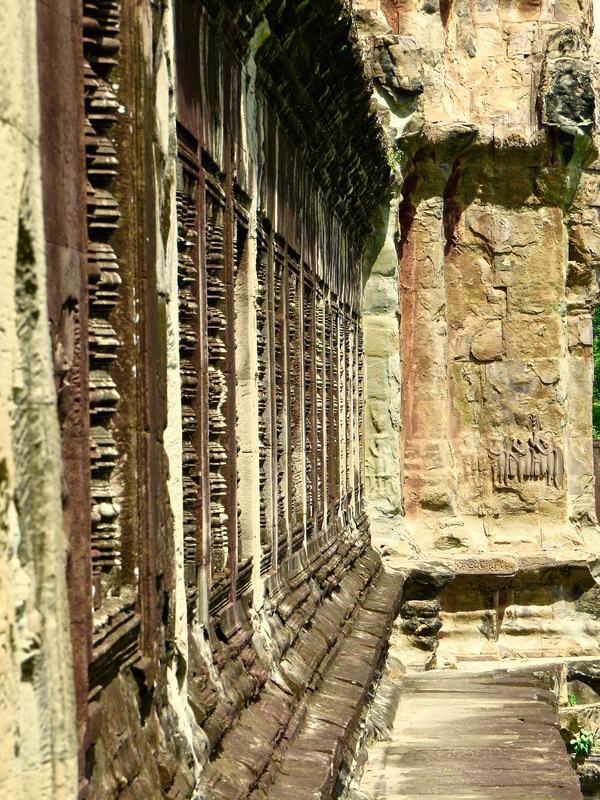 One of the Angkor Wat towers and balconies. A cemetery at Angkor Wat. 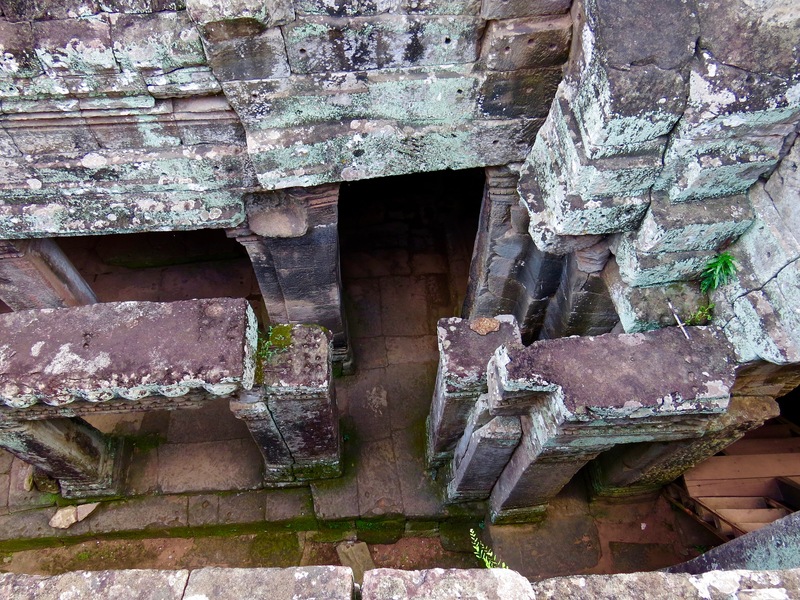 Tomb Raider, Jungle Temple or Ta Prohm? Here is a spot that nearly everyone is familiar with, even if they don’t realize it. 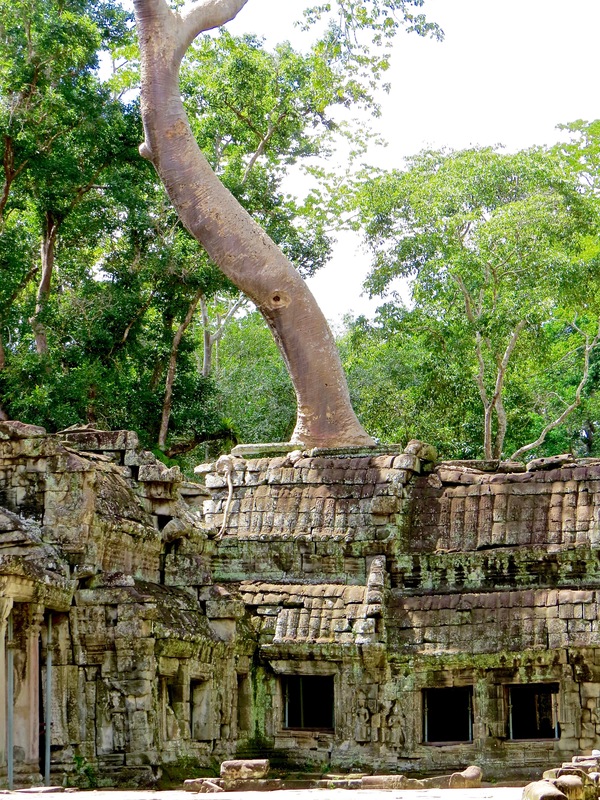 Most famously recognized from Tomb Raider, Ta Prohm has survived from its origins in the mid 12th century. 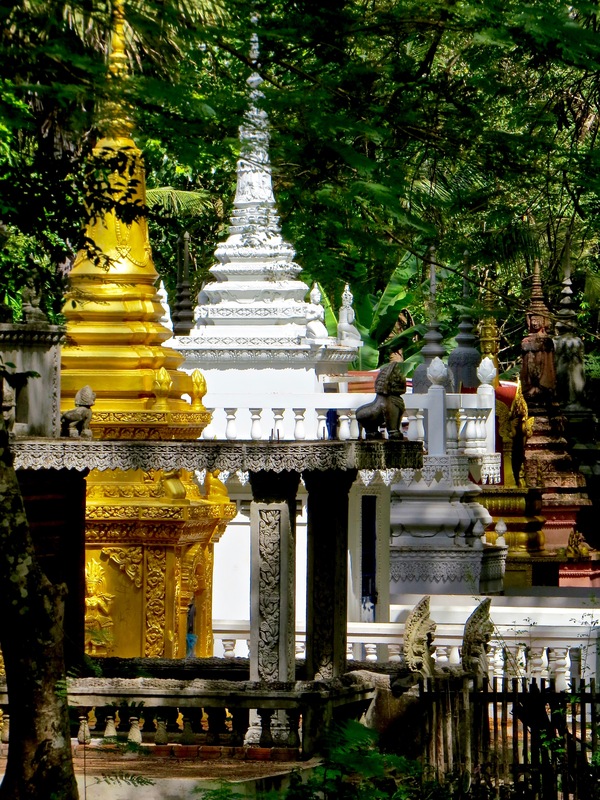 The famous Banyan tree root snakes its way through the temple. There are hundreds of statues in the complex. 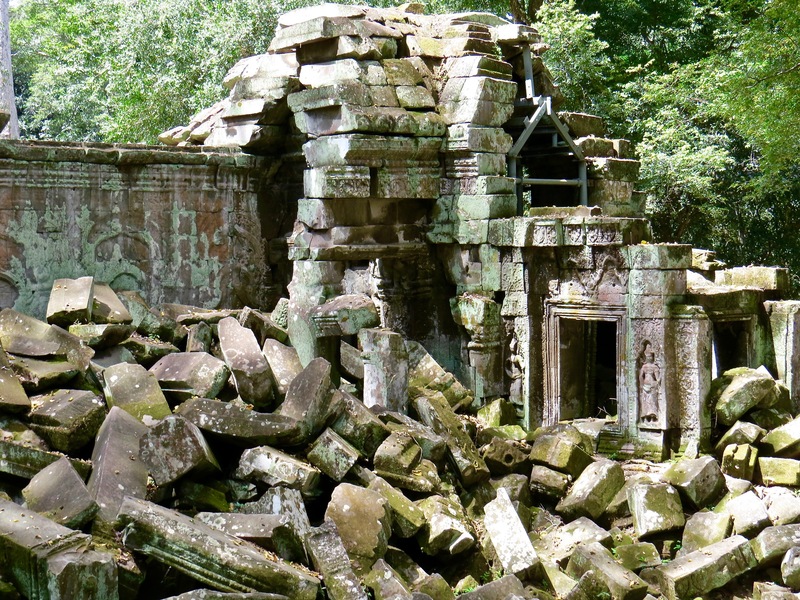 Ta Prohm is under a long, delicate preservation and restoration process. Primarily, this involves structural strengthening to prevent any further, rapid deterioration. 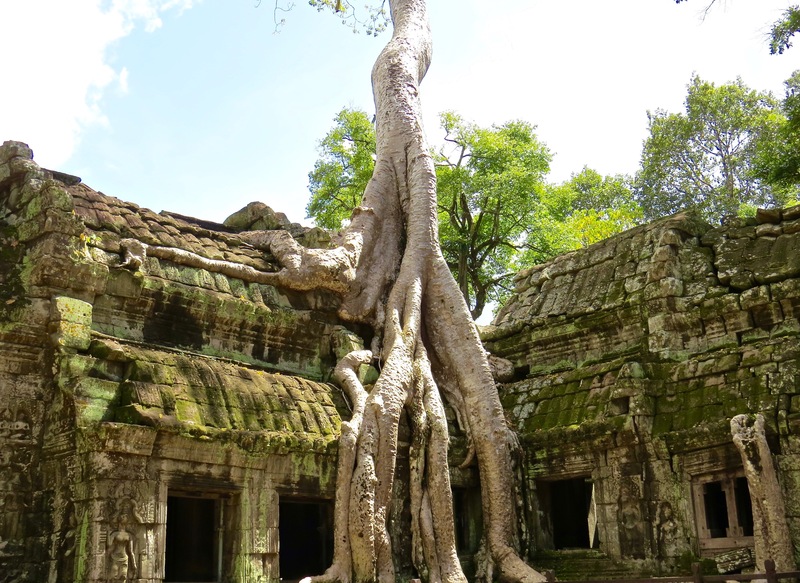 The famous Banyan root at Ta Prohm. The Banyan tree rising out of the temple. Angkor Thom. It means the great city. It is the temple of faces. Each tower has four carved faces so they can be seen from any direction. 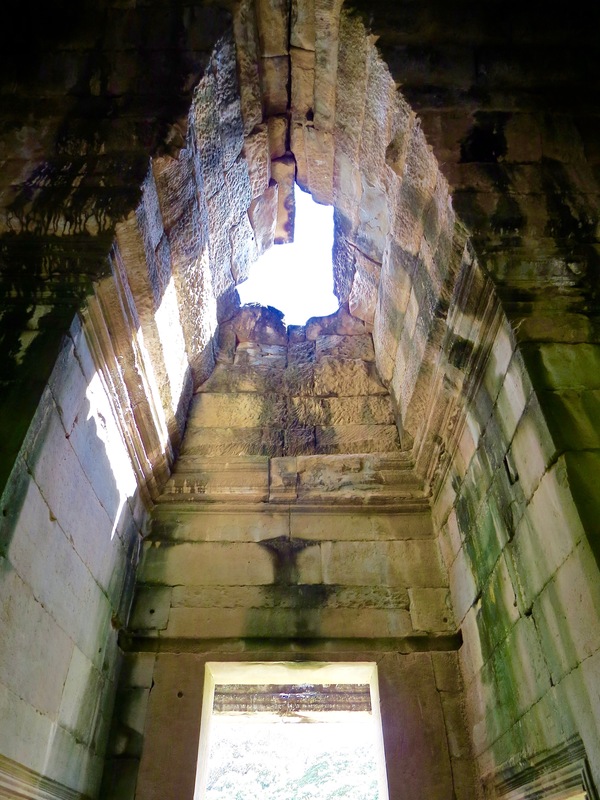 Angkor Thom was the final capital of Khmer Empire. The city was surrounded by a wall with causeways lined with 54 statues on each side leading to the entry towers. 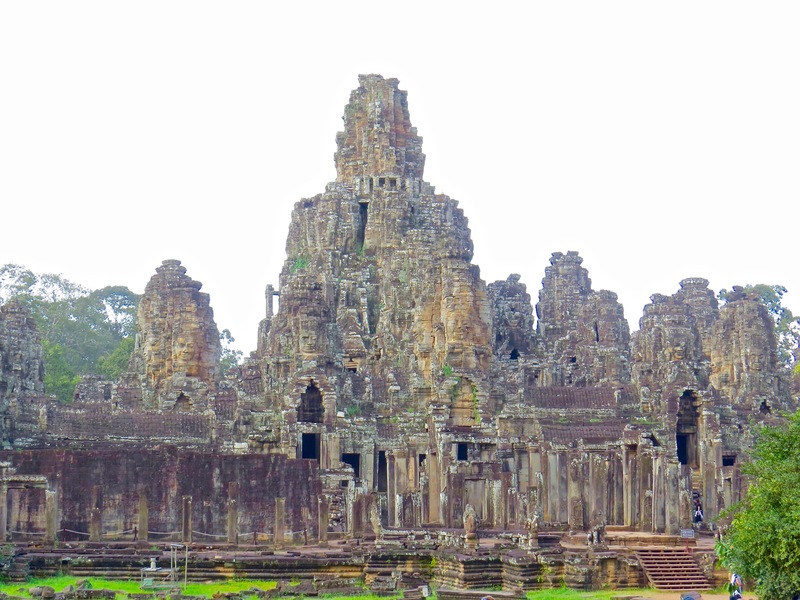 Inside the ruins is the magnificent Bayon Temple… a sight to behold. 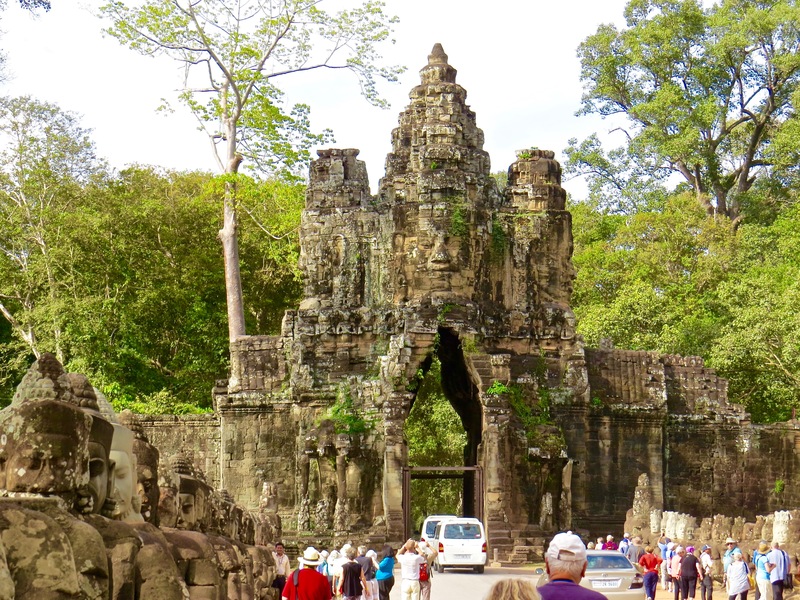 The causeway and entryway to Angkor Thom. 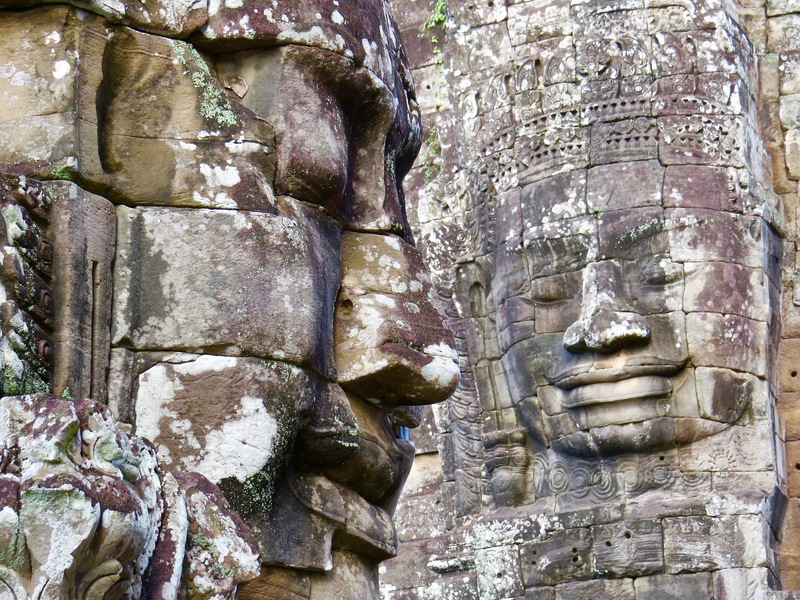 The Bayon Temple of Angkor Thom. Looking down in the maze of pathways at Angkor Thom. Four faces surround every tower. I took nearly 800 photos today. In an effort to try and keep up with posting here, I’m only sharing a few now. 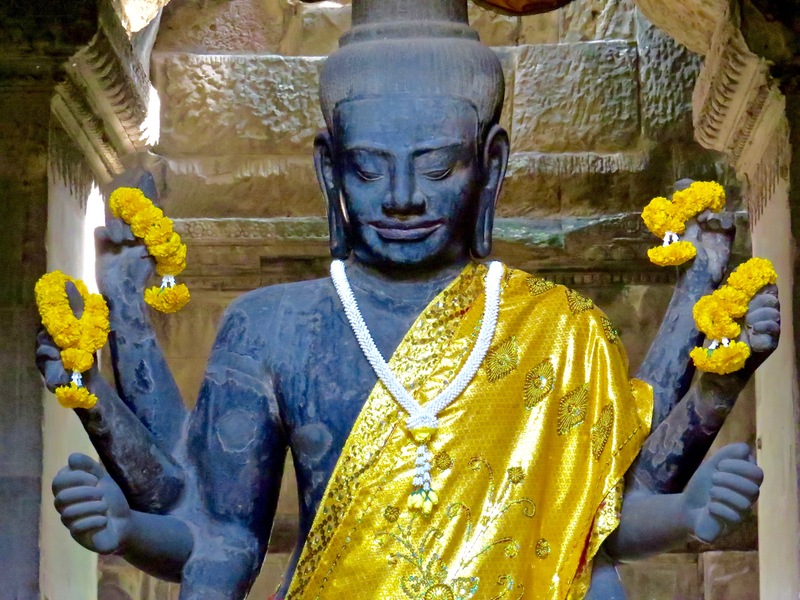 Later I’ll do a couple photo essay posts with many more pictures of the Angkor temples. This was such an incredible experience.